“85% of people will abandon a transaction if it takes longer than 30 seconds,” according to research provided by Pushpay, the developers of a smartphone app that makes it possible to give in under 10 seconds. Does it take longer than 30 seconds to make a gift on your current mobile giving system? Are you required to sign in before you can give? Do you have multiple web pages to navigate before a gift can be made? If you answered yes to any of these questions, this blog post is for you! Refresh your cup of coffee and read on. I was able to have some Q&A time with one of the directors at Pushpay recently. Pushpay provides a secure, quick, and easy mobile giving solution to churches across the country, and I am excited to share his insights with you here. Q: We talk quite a bit about accelerating generosity on my blog. How can a service like Pushpay encourage generosity within the church? A: Technology is enhancing the way we tackle things in everyday life. And we are striving to ensure that the church stays at the front of the innovation curve. It’s not just about providing tools that make the ability to give easy, it’s about creating opportunities to help change the hearts of people and provide easy entry points to a journey of generosity. With the bulk of giving in a church coming from 25% of its members, it’s vital to have the ability to make a first time gift easy and to encourage a habit of generosity in a new or previously intermittent giver. Q: How does Pushpay make it easy for a first-time giver to be generous? A: We provide simple and clever tools that mirror people’s everyday experiences with the latest technology. Often we experience the latest Apple and Android products, Monday through Saturday and then we are confronted with Windows 95 on Sunday at church. Whether someone decides to give online, via a kiosk or their smart phone, an initial gift or registration can be completed easily (in about 45 seconds). We have designed our technology to make it about the giving itself, not a series of processes. After that initial gift, many people go on to download the app and make a gift. Once people have the app on their phone, they’re able to respond quickly wherever or whenever they feel moved to give. Q: People are relying more and more on smartphones and tablets. Why do you believe churches today must provide a mobile giving solution? A: Technology is being embraced in all areas of life, and people expect immediacy. The church should not be behind the curve. The real strength of mobile giving is in providing the ability for people to respond “in the moment”. In other words, when I feel moved to give in a service, I no longer need to remember to visit the kiosk in the back, or request an envelope. I don’t carry cash or checks, but I do have the ability to reach into my pocket and complete a gift in literally seconds. Q: Why is it important to provide people with an easily accessible mobile giving solution? A: Because technology needs to support behavior that encourages generosity. To that extent we’ve designed our entire solution to promote the use of the app. By doing that we’re not confining generosity to a church-based activity. It’s something people carry with them every day. Nearly 40% of giving through Pushpay happens on days other than a Sunday! Q: Your website boasts Pushpay as the first genuine 10-second mobile giving solution. Why is 10 seconds such a big deal? A: 85% of people will abandon a transaction if it takes longer than 30 seconds. Fast and simple is the winning formula for mobile giving. We know that the ability for someone to respond and make a gift in a very short time leads to an increase in giving overall. When all you need to do is enter your gift amount, the fund you’re giving to, and a 4-digit pin, the experience becomes more about the act of giving and less about stepping through an overly complicated process. Q: Pastors may think “mobile giving and online systems are for big churches with even bigger budgets – there’s no way we can afford this.” How do you tailor your service to fit a small-to-mid-size church’s needs? A: Our approach is to tailor our pricing to each church based on their size. We know that when a church implements Pushpay, they see an easy approach to engage new givers and an increase in their online transactions and spontaneous giving. We also believe in what we do, so much so that we don’t tie churches to any fixed term contract. And if our solution is not suited to them they can drop out at any time. To date no church that implemented the 5 Pillars to Success has ever left. Q: The USA Today published an article on June 3rd . It stated that a recent survey showed 24% of Americans have stopped buying online due to breaches in internet security. How do you see this impacting the online giving model? What can we as churches be doing to assure our people that giving online is secure? A: It is critical that any mobile giving product offers the highest level of security available. With Pushpay the credit card / bank account remains with the giver. Churches never view this information, so fraud is virtually impossible. Pushpay is Level 1 PCI compliant, so we have the highest level of compliance available. Q: What changes have you seen over the last 5 years in giving, and in mobile giving specifically? A: Almost every church we speak with tells us of the decline in giving by check, and banks have been discouraging the use of cash because it is costly for them. But the most dramatic change has been in the last 2 years. We’ve seen most websites reporting over 50% of their traffic now comes from a mobile device. Q: What are you doing with Pushpay to prepare for the future of giving? What do you see on the horizon for e-giving? A: The future of e-giving is changing fast. Now 91% of people in the United States have a mobile phone, and those are increasingly becoming smartphones. But we’ve found that even many of the most innovative churches are still in the “old way” of e-giving, having a different vendor for each unique way to give: text, kiosk, online, and mobile. We’ve also found that these multiple vendors don’t typically integrate with the church’s database, making it difficult for the church administrator. The “new way” is having one platform for all digital giving which givers actually enjoy using. This way provides givers the flexibility and choice to give however they want, without having to create multiple accounts. It also ensures that however the gift is made, it integrates with the church’s database, making giving easier for both the giver and the church. To prepare for this future, we’ve designed Pushpay so when a person gives through text, online, or kiosk they are automatically moved towards mobile and the 10 second giving app. It’s incredible! We see about 40% of people who give end up downloading the app, and 90% of those people using the app. 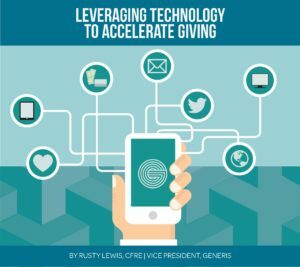 In the future we’re going to increase the options for givers, while continually increasing the speed, ease of use, and automation for both churches and givers. Q: What are some of the wins you’ve seen with churches who have implemented Pushpay as a giving solution? Many have doubled their online transactions within a few short months. We’ve seen repeated reports of record numbers of new givers just months after implementing Pushpay. After 5 months a church of 1,100 was on track to increase their church budget by 10% for the year. Physically impaired people in a congregation previously had to sit and watch when the bucket was passed as they were unable to fill in a check. But with a mobile phone linked to their wheelchair they’re now able to participate in this important part of the service because the process on the Pushpay app is so easy. We have talked before about the importance of the ease of mobile giving. So this isn’t a new concept to my blog, but it is now proven research straight from the source that it does make a difference! What is your mobile giving solution, and how can it be improved to help accelerate generosity in your ministry?